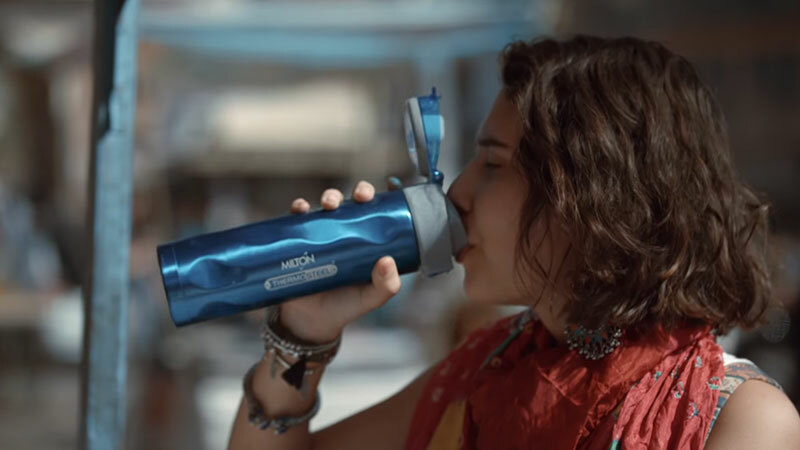 Milton released a new campaign for Milton Thermosteel Bottle. Kahaan Ka Piya positions the product as a travel essential for every explorer. Kahaan Ka Piya aims to connect with the youth of India by means of a solo traveler’s journey, appealing to their sense of adventure and self-discovery. Conceptualized by Ogilvy India,the film portrays a solo vacationer’s journey across the country, capturing the beauty of travel and a world of opportunities. The thrill of solo travelling has witnessed an increasing interest by women over the last few years and Milton’s new TVC is an ode to this trend. Treating self to a one-of-kind experience, the young traveler’s escapades feature the bottle as her sole companion as she explores different parts of India in diverse weather conditions, from the hot and dry climate in a beautiful sandy desert, to the cold and minus degree temperatures of magnificent snow covered terrains.The background music with its apt chorus, ‘Tune Kahaan ka Piya’ questions the viewers and encourages them to tread onto unfamiliar terrains and explore the unexplored with Milton Thermosteel Bottles by their side. Ajay Vaghani – Managing Director, Hamilton Housewares Pvt. Ltd., says,“Milton as a brand has always believed in product innovation that focuses on enhancing experiences of every small yet integral event in the consumer’s fast paced lives and makes it effortless.‘KahaanKaPiya?’campaign is all about inspiring people to travel and we believe Milton’s Thermosteel Bottle is the next must-have accessory for every young explorer’. Milton Thermosteel Bottle,with its aesthetics and functionality, was created keeping in mind the changing requirements of the youth in India who are constantly on the move seeking knowledge and looking for new experiences”. Anurag Agnihotri– Executive Creative Director, Ogilvy India, “KahaanKaPiya? How many rivers, lakes, streams and seas have you crossed? How much of the world have you seen? That’s the question this commercial poses to all the young people sitting at their desks, in offices or colleges, to go out there and explore the world. It’s a perfect communication fit especially when it comes from a brand that offers top quality and innovations in its products”. Staying healthy and hydrated while travelling is essential and Milton’s Thermosteel Bottle is a perfect solution and a must-have accessory in your travel bag. Its unique temperature retention mechanism helps keep your beverages hot or cold for 24 hours and its sipper comes with a one touch lid locking mechanism. The bottle is available in trendy and attractive colors. The campaign will run from 12-08-2018 onwards on major Hindi, English, Marathi,Bengali, Malayalam, Tamil, Kannada and Telugu TV channels. In addition, the TVC will also be promoted on YouTube, Facebook and Instagram. PhonePe’s Daddu is in love with UPI! #ExpertsTalk: Will TikTok bounce back?